Montrail is a shoe company with a long history in trail running, and with ultra running in particular (at least from my viewpoint). They sponsored the Montrail Ultra Cup and Western States 100 for quite a long time, as well as supporting an ultra running team very early on, and being one of the premier sponsors of runners. 2015 saw Montrail shifting gears by reducing both event and athlete sponsorships in an effort to retool the brand and go back to the drawing board of producing some compelling footwear. When I first heard this from Montrail, I assumed either one of two things was happening. Either they were just saying this, and really their time was limited as a brand, or it was really true and they were focusing on the product first. 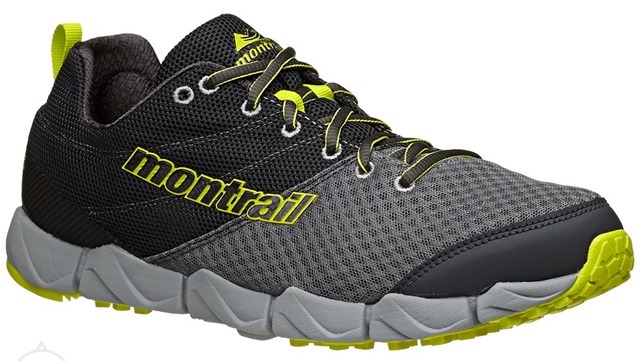 I’m happy to say it is the latter, and Montrail has produced some great new models for 2016. I have all of the new models, and reviews will be forthcoming, but the Caldorado is up first. Weight: 309 grams (10.9 oz) mens 9 and 277 grams (9.8 oz) womens 8. 380 grams in my size 13. Stack Height: 26mm heel; 18mm forefoot. Good shape to the shoe with a wider forefoot than appears in the pictures. Medium volume throughout and should fit many different feet well. The Caldorado is built on a brand new last, and the fit is one of the best of all the Montrails I’ve tried. I think they really got the shape and volume right as the fit is secure overall, but still has a little more width in the toebox than say the Rogue Racer or Bajada. The upper is a pretty tough mesh and features fairly robust overlays throughout the midfoot, without being overbuilt. The result is that the upper holds my foot really well, and I don’t find myself having to tighten the laces much due to upper stretch throughout the run. Other than one minor issue, which I resolved, the upper is pretty much what I’d like to see in an all-around trail shoe like this. The issue I had was that the material they used to back the eyelets and connect to the tongue gusset was super stiff and extended too far down to the toes. This resulted in removing a fair bit of skin on my first run in them. After looking the shoe over and determining that it wouldn’t harm the shoe at all and actually would save some weight in addition to making it more breathable, I cut the gusset and removed the backing material. Fluidflex upper showing the same material that I cut off the Caldorado. Notice the material removed including the gusset and stiff eyelet backing. The offensive material. That white colored material is super stiff and hard which doesn’t flex well and goes way too far down past the tongue attachment. The difference on the next run was substantial in the comfort department, and I’ve since done a 20 mile trail run sock-less with zero problems. Not sure why they opted with this design on the Caldorado and Fluidflex FKT (I did the same procedure on the latter) since the Trans Alps has a much cleaner design in this department. The good news for me is that it was an easy fix, and the shoe is actually better for it. One other thing I should mention is that Montrail’s new footbed is fairly problematic as well. They construct the last half of it out of EVA, and this is not good if you run sock less (irritation on arch since EVA causes friction when wet). Furthermore, the footbeds are fairly heavy. I just swapped them out for a more standard footbed. The Caldorado is very much a generalist in terms of its midsole design and ride (and outsole for that matter). In this particular shoe, and how Montrail pulled it off, this is a really good thing. The shoe basically rides like a road trainer, and is at once both forgiving and still responsive. I wouldn’t classify it as a racing shoe or particularly speedy, but it definitely isn’t aiming for max cushion or plushness either. The Fluid Guide that Montrail uses on all of the new 2016 models is really one of its best features. What they do is blend the foam densities from soft in the heel to firm in midfoot and then softer again in the forefoot. Clean, simple and functional all the way around…and bright! The result is a much more stable and supportive midsole for long runs and on more technical terrain. One thing I thought was going to be an issue for me with the Caldorado is that the heel flairs out quite a bit, something I usually don’t prefer. However, after running the shoe on smoother trail, and even some road, I found that the midsole really provides a lot of support and stability for longer outings in a more compact package, and I think the heel does contribute, in this case, to that stability (not always the case with every shoe). If they had aimed the shoe for more technical or mountain terrain (i.e. more lug), it would be more of an issue. Overall, the ride is a really nice, middle of the road package, that I could see running up to 100 mile races in, but it doesn’t feel overly built for shorter runs either. Montrail’s Fluid Foam is one of the better injected EVAs on the market, and the shoe just works as intended and advertised. The outsole on the Caldorado is a great design as well, with lower profile lugs than the Trans Alps, and similar to the Bajada, but a little more hard terrain specific, which was the intent of the shoe (and thus the odd name of Caldorado, a combination of California and Colorado, the type of terrain it was designed for). I really like what they did with the perimeter lugs, which are tilted in the direction of travel, but they left the lugs on the interior of the outsole more multi-directional. They aren’t super deep lugs, but aren’t non-existent either at a 5mm lug depth. On the 20 miler I used them for, I encountered a wide range of conditions from road to smooth trail, to rocky trail, and really slick mud, and the shoe did well in everything but the mud. To be fair, most shoes, other than fell running type shoes, would have done just as poorly in mud. Better yet, the outsole compound they use is both adequately sticky on rock, but very durable, and shows hardly any wear at this point. 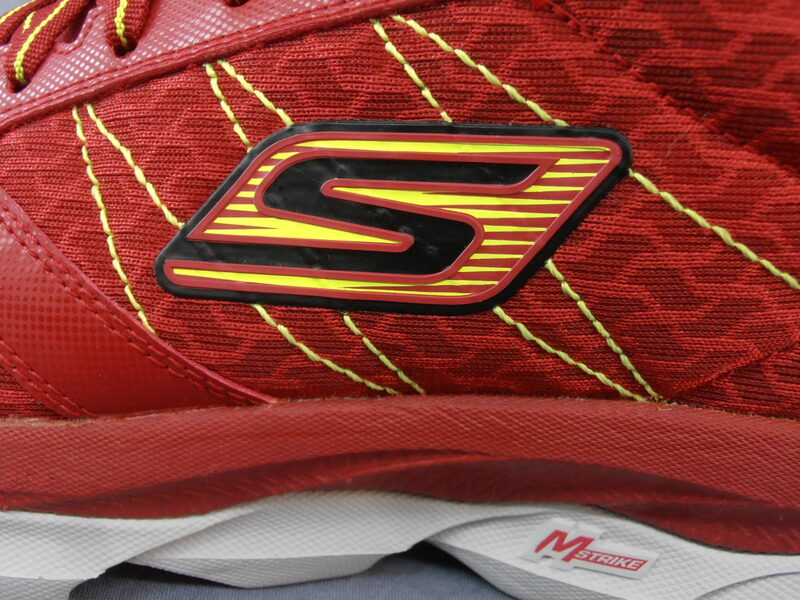 The one other notable feature about the outsole of the Caldorado are the significant flex grooves in the forefoot. I wasn’t too keen on these initially, but again with the end design intent of smoother, dry trail usage, they really make the shoe feel much lighter and more nimble than its 11 oz weight would imply. The flexibility is great, and with the co-molded rock plate, I haven’t noticed any protection issues either. Again, if it was intended for technical trail, I think the flex grooves are a bad idea, but as an all-arounder, it works well and makes the shoe less clunky which is nice. Fantastic outsole design with almost all the elements I look for in an outsole. If you’ve read this far, then you can probably already guess that I really like the shoe. I think Montrail has made a fantastic all-around trail shoe that will handle long miles and yet still be enjoyable on shorter outings. The materials are quality and durable, and the design is smart and functional. If you have dry, hardpacked trails that you run on, I really can’t think of too many shoes out there that perform as well as the Caldorado. The Pearl Izumi N2 is probably the closest competitor, but a much different approach with the PI shoes using a rocker and wide midfoot, whereas the Caldorado has a narrower midfoot midsole design and gains stability with the higher density foam (Fluid Guide) in the midfoot. I also think Montrail’s Fluid Foam is superior to PI’s (one of the biggest drawbacks of the PI’s in my opinion). All in all, the Caldorado is highly recommended and will certainly be on my feet a lot this summer as the trails dry out. Montrail has done a fantastic job nearly re-imagining the brand, and has come out with some of their best models yet. More reviews to come of the Trans Alps and Fluidflex FKT. The Montrail Caldorado is available for purchase at Running Warehouse and Wiggle. David, I’m curious why you seem so adamant about running trails sockless? I went from the FluidFlex 2 to the FKT hoping the upgrade would add the few things that were missing from the 2 that I loved (rock plate, beefier/sturdier design) and it just about did. The FKT is a bit too stiff for me but worked well on my recent 50mi. I’ve also not had any internal problems, but I suppose socks have fixed that. Sorry for the late reply…Wordpress is not sending me email notifications lately when a comment is posted and I’ve been traveling the last week. RE: sockless running, I actually think it is the optimal way to get the right fit and prevent blisters for longer runs if you give your feet time to adapt and the shoe doesn’t have any glaring issues in fit. I’ve got lots of reasons for this, but that would take a whole post to explain, but I’ve been at this for 5+ years sockless and just ran a 50 miler last weekend with no socks in the Nike Kiger 2 and had not a single issue. Have you run in the north face litewave tr? Would be interested in your thoughts if you have. I have been doing Nordic Walking using the Montrails. Where I think the shoe really stands out is when you go off trail. It really performs well in uneven terrain. I was actually surprised. Most of my walking was on cinder/crushed gravel and it works well there, but once you start going over larger rocks and things like that the shoe really does a great job. Most of my runs are on road or crushed gravel and my shoe of choice are the Under Armour Gemini 2s. They aren’t off road shoes, but are my favorite ones to run in. Extremely comfortable. Have you had a chance to go sockless with them? They don’t have a shoe insert. I wrote an article up on the Gemini and should do one on the Montrails.